On a sultry evening in the Bahamas, millionaire guests dine on French cuisine in a tiny four-star island restaurant over looking the marina, while an overloaded Haitian sailing vessel founders on a reef so close to shore that passengers might have smelled the savory food. Scores of terrified black people are suddenly thrown into the sea. Most of the elderly quickly drown. Younger refugees struggle to stay afloat, while friends and family are pulled under by marauding tiger and bull sharks. During ensuing months, this tragedy infects the tiny island civilization like a biblical plague. 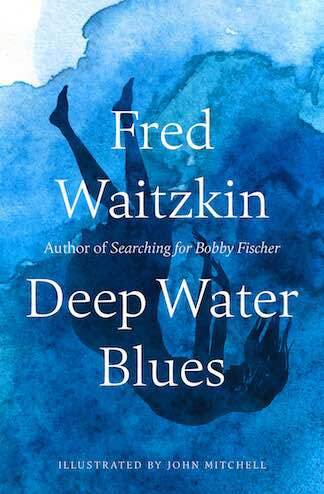 In Deep Water Blues three elderly men and one younger man, a painter, who has never been to sea, leave Ft. Lauderdale on an old boat heading into stormy seas for a distant Bahamian island that has become shrouded in rumor. The older men are searching for adventure, excitement or at the very least, intimations of past youth and glory. What will they find? What will they find in themselves? They arrive at dusk, anchor for the night. The island is veiled in darkness that feels like pure gloom. In the morning they see desolation everywhere in this place that had once been a verdant jewel emerging from the deep blue sea. There is no vegetation as though the cay had been hit by an atomic bomb. Not one soul is walking the beach. They scan the shore with binoculars and observe a small cemetery with head stones turned over and bones sticking up from the earth suggesting a vile inexplicable desecration. A curated blend of real-life experience and fiction, Deep Water Blues recounts a savage private war to control Rum Cay, the colonialist manipulation of its native population, and the astonishing redemption of the man who was the king of this exquisite place he carved out of rock and sand.